The Anime Archivist: Video Backlog: "SOS! Tokyo Metro Explorers: The Next"
Video Backlog: "SOS! Tokyo Metro Explorers: The Next"
Story Outline: After his parents split up, 11 year old Ryuhei Ozaki discovers a note book titled “Tokyo Exploring Records” written by his father when he was Ryuhei’s age. 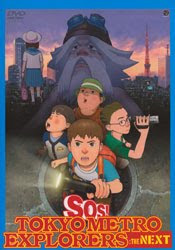 With his friends Yoshio and Shun, they decide to explore Tokyo’s sewer system using the map inside his father’s note book. However Ryuhei’s younger brother Satoshi manages to tag along. Unbeknownst to the group of explorers is Yoshio’s nosy younger cousin, Momoyo who plans to look out for them so they don’t get into trouble. After some initial difficulties, the small group of explorers discover an amazing underground world and it’s strange inhabitants, unknown to those above ground. Mini Review: Another weird arse Bandai Visual USA title. It seems that right from the start that this title was to have a dual Japanese/US release. The disc is identical to the Japanese release, except for the different screen printing on the disc and the booklet and packaging. As always, it’s really good, except it’s a bloody expensive release. The content itself doesn’t fare as well. The short movie is based upon an almost unknown Katsuhiro Otomo one shot manga originally released in 1980. The reason such an old manga was resurrected some 26 years later? Well believe it or not Sunrise was actually thinking about making “Steamboy 2”, but it got canned and in its place we have this weird short. It’s sort of like a demonstration film to show off cel shaded CG, sort of like those terribly mediocre “Appleseed” movies, except more “anime” like and hell of a lot more distracting. It’s the key problem with this film. The animation is really off putting. I don’t know what it is, but it just looks like something isn’t right and I can’t put my finger on it. I want to get involved with the story, but I’m too distracted by the character animation. Second problem with this film is there is way, way too much going on. There’s some great stuff here for a film (it’s sort of like a more down to Earth and realistic Japanese take on “The Goonies”), but there is just too much happening. A full length film would have been much better. I note that Sunrise really hasn’t made another film with cel shaded characters like this, though the awful “King of Thorn” uses CG cel shaded characters for a lot of long shots. And it still looks out of place and shoddy in 2010. Unfortunately I can only give this film 5 out of 10. Video Backlog: "Overman King Gainer"
Video Backlog: "Ghost in the Shell"
Video Backlog: "Key the Metal Idol"